George Herbert Walker Bush, the 41st U.S. President, has died. To say he lived a rich life would be a great understatement. 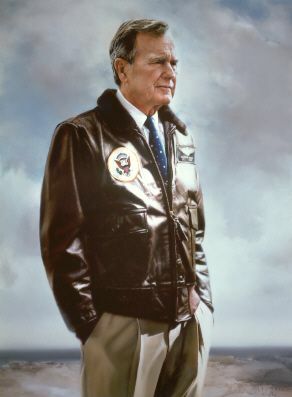 He served in World War II as the youngest Naval pilot, went on to prosper in the oil industry, was a congressman, saw the Republican party through the travails of Watergate, was President Ford’s ambassador to China and then his CIA Director. He ran for President in 1980 only to lose to Ronald Reagan in the primaries but the Gipper saw his value as a wingman and made him his running mate which thrust him into the Vice-Presidency for 8 years. He then ran on his own and thanks in large part to Mr. Reagan’s coattails, he won. He went on to lose re-election 4 years later to one of history’s greatest politicians, Bill Clinton. While the accolades are flooding in from both sides of the aisle (Democrats love Republicans who lose to them [see: John McCain]), few people remember his shortcomings. Specifically, when he ran on his own in 1988, he was identified more for what he was not, Michael Dukakis, than what he stood for. And when he called for a “kinder gentler nation,” it was unmistakable that he disagreed with Reagan’s economic and social policies. He also derided “the vision thing” that Reagan clearly had. This page will always remember his eulogy at Mr. Reagan’s funeral when he emotionally said that the 40th President taught him everything he knows abut politics. An initial read would interpret such as meaning he used Reagan’s lessons but for those who knew, he basically meant that he didn’t believe in the Gipper’s policies but found out the hard way that Mr. Reagan was right. A great fantasy of this page would have had Mr. Bush realizing that he was tapped out by 1992, which the debates showed when he was checking his watch, and not running again. Bob Dole would’ve come in as the deficit hawk to take advantage of the peace dividend and after that Jack Kemp could have been the President who addressed social policies and forever taken such away from the Democrats. But ego would not allow Mr. Bush to abdicate. We hope this country has many more soldiers and public servants like our 41st President, but we’ll be fine if no more Presidents like him. This entry was posted on Saturday, December 1st, 2018 at 1:59 pm and is filed under Ruminations. You can follow any responses to this entry through the RSS 2.0 feed. You can leave a response, or trackback from your own site.